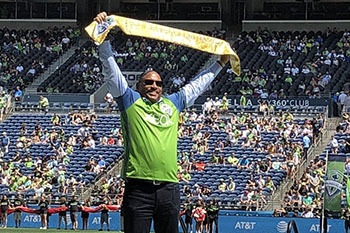 Andrew Lofton and Seattle Housing Authority were presented with the Golden Scarf award at the July 29 Seattle Sounders FC match. 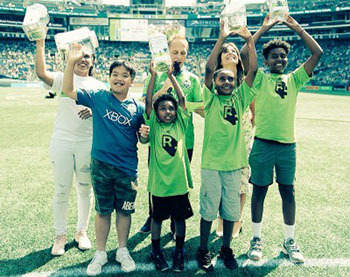 The award honors the partnership and community-centered efforts between SHA and the RAVE Foundation to bring services to the Yesler Community that are focused on soccer, art, and community-building. 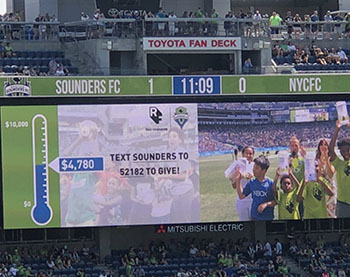 A few times each season, Sounders FC selects members of the community to honor their service. They are presented with a special gold scarf, which has come to symbolize the game of soccer. Awardees raise the scarf over their heads, signaling to the fans to do the same.